To make sure Aerobeans serves you and other buddies at Aerobeans better, we do not honor cancellation and/or refund once your order is placed. 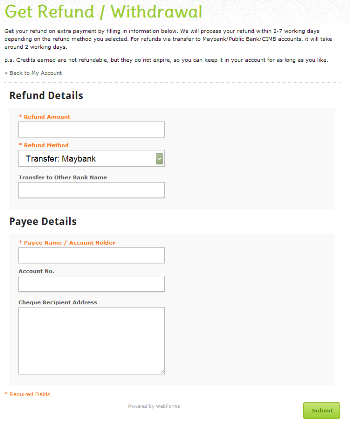 Once you login, just click on 'Get Refund / Withdrawal' to submit for a refund request, as shown in screenshot below. Aerobeans does not handle returns currently. However, stay tuned with us as we will post some shopping tips and guides occasionally for our buddies. Make a remark at the shipping bill about what items are missing before signing. Keep the shipping bill and take a photo of it. Keep the entire shipping parcel (must be everything including the boxes) and take a photo of it showing the total weight of the shipment. Send the photos to crew@aerobeans.com, stating your order number, the name and link of the missing item.